December 18, 2008 by rwb, under Microcontroller. The PIC microcontroller is quite popular in industrial and hobbyist, some of the newest 8-bit midrange Microchip PIC microcontroller with nanoWatt technology is PIC16F690, this 20 pin microcontroller has a build in peripherals such as ADC, UART, PWM, I2C, analog comparator and with 7KBytes program memory flash; for those who’s come from the AVR background this is a good change to gain the knowledge as we know is hard to find the comparable 20 pin 8-bit AVR microcontroller product which has the same feature as Microchip PIC16F690; and for those who are the first time learner welcome to the PIC microcontroller world. Down load the latest Microchip MPLAB IDE which provide you with the complete IDE (integrated development environment) for managing project, program editing, compiling, debugging and downloader for all Microchip PIC Microcontroller series. The MPLAB IDE is already come with the HITECH PICC-Lite C compiler and fully integrated with MPLAB IDE. After downloading, install the Microchip MPLAB IDE and just follow all the default setting. The TRISC is a three state bidirectional buffer control register for PORTC, by clearing all the bit (set to logical 0), we instruct the PIC microcontroller to use the PORTC as output port (by setting to logical 1 mean we use for input port). 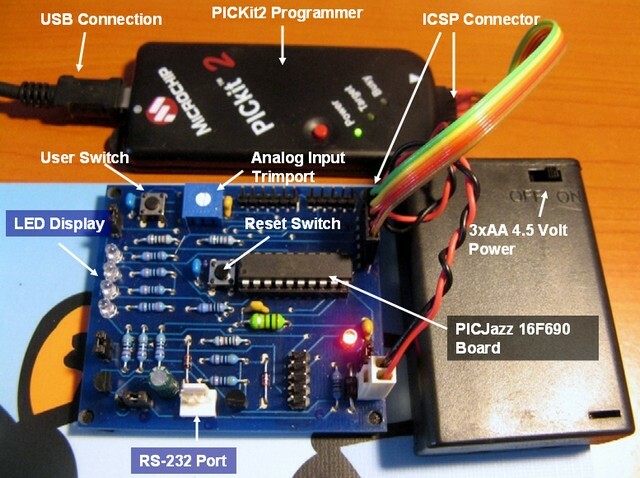 The NOP() instruction is just the no operation instruction for PIC microcontroller, this function is used for setting the break point in the MPLAB IDE simulation before we download the code to the PICJazz 16F690 board. You can always use this NOP() function as many as you like to set the break point as this instruction will not effecting your code and removing it later. 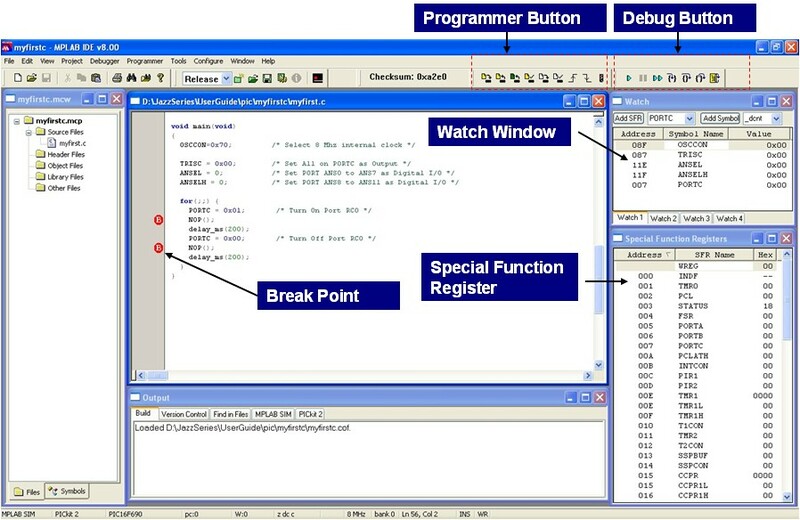 Debugging your code before burning it to the microcontroller is the essential part in developing embedded system; using the sophisticated Microchip MPLAB IDE simulation will give you a deep walk through to your code and watch how the PIC microcontroller responding to your code. The good part is; you don’t have to use any physical microcontroller to use this simulation tool, just your computer and of course the Microchip MPLAB IDE. Ok let’s start setting the environment before we start the simulation. You could also watch all the special function register by activating the special function register window, from menu select View -> special function registers. 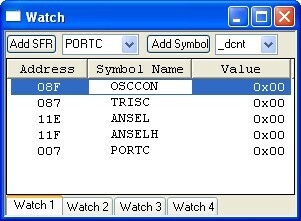 You can look on your watch windows the PIC16F690 registers change by continuing press the F9 key. To reset the program, from menu select Debugger -> Reset -> Processor Reset or press the F6 key. Disconnect the ICSP port from the board and watch the LED blink. I try to compile this code but getting error for pic.h file. Can you please let me know from which location I can download this file. Make sure you are using the latest HITECH PICC Compiler and the Microchip MPLAB, when you install it correctly the pic.h file will be automatically recognized by the MPLAB IDE. Before you compile, check your language tool suite on MPLAB IDE: Project -> Select Language Toolsuite and make sure you select the HI-TECH Universal ToolSuite. Nice work! Your posts are very helpful! I am facing a problem and I would like to ask for some help! When I copied the code to the MPLAB IDE and tried to build the code, I got an error message about the “__CONFIG(INTIO & WDTDIS & PWRTEN & MCLREN & UNPROTECT & UNPROTECT & BORDIS & IESODIS & FCMDIS); ” command. When I erased this configuration command, everything worked fine, except the fact that the configuration bits were missing. Do you know what’s the problem or what am I doing wrong? Thank you for your time! Keep uploading interesting projects!!! Thank you! Make sure you install the Microchip HI-TECH C Compiler for PIC10/12/16 MCUs (Lite Mode) V9.80 or above correctly and check your MPLAB IDE C compiler setting. 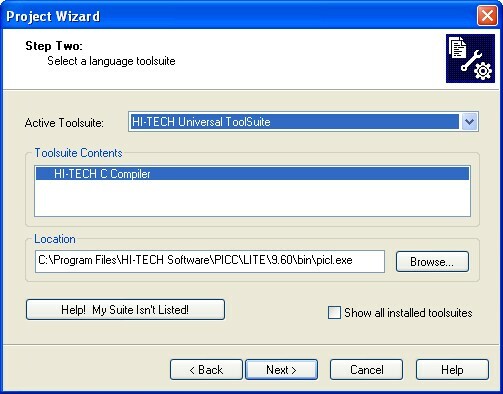 From the MPLAB IDE menu choose Project -> Select Language Toolsuite, and on the ToolSuite Contents choose HI-TECH ANSI C Compiler (default installation location: C:\Program Files\HI-TECH Software\PICC\9.80\bin\picc.exe). Next try to recompile your code. Hey. nice cod . I have tried this cod and the compiler give the same error from the user p4n4k4ts. I comment the line whit config and works ;). is to no write this part of cod in mplab with __Config… because is in file .h ? The “undefined symbol” error message when compiling the C code on MPLAP IDE is due to wrong compiler setup and configuration. When you use the Microchip HI-TECH C Compiler you only need to use the include “pic.h” header, because the compiler will automatically set the correct header for the default device selected (microcontroller) when you first start the project wizard. You could check or change the selected device in MPLAB IDE Configure -> Select Device menu. Please allow me to join your discussion. What I found is that when I downgraded from MPLAB 8.66 (I think it is the latest version) to MPLAB 8.50 everything worked fine!!! 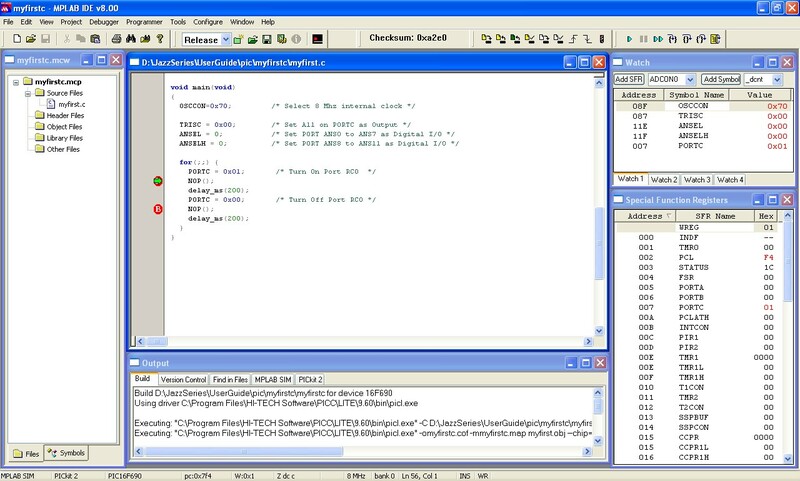 The code should be compiled with the new version of Microchip MPLAB IDE v8.66 and HI-TECH C Compiler v9.80 correctly. 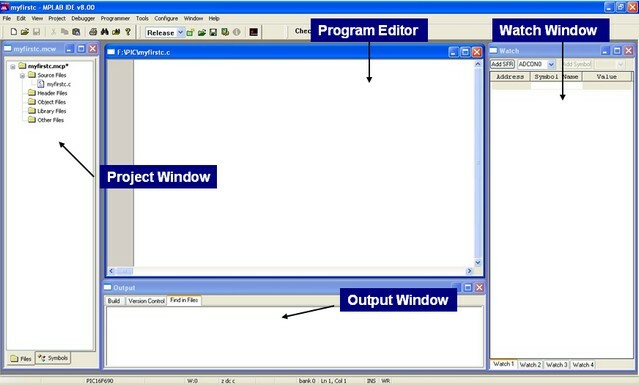 The original project is compiled with MPLAB v8.00 and HI-TECH C Compiler v9.60. 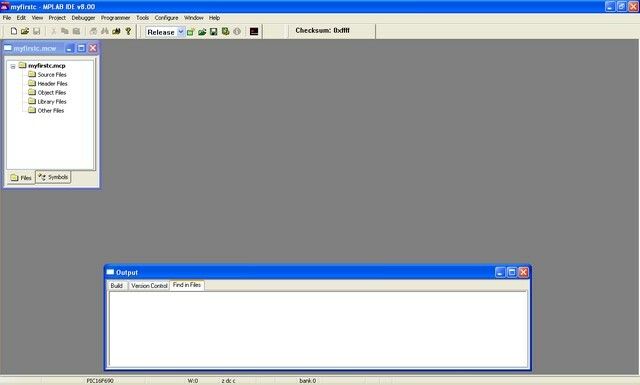 Currently I used Microchip MPLAB IDE v8.63 and HI-TECH C Compiler v9.80. @p4n5k4ts: You could try to upgrade back to Microchip MPLAB IDE v8.66 with HI-TECH C Compiler v9.80 and see if it work. I have the v 9.81 of HI TECH c Compiler and the Mplab v 8.66. I write the program with the line comment of __Config …. , and it’s fine. Sometimes when i debugging whit PIC kit2 , the code is write in the microcontreler and when I do the F9 and F7 say and error “PK2Error0030: Failed to read target file registers” and i puts the breakpoints to stay . Sometimes work and sometimes no . I use a sensor QRE 1113, have you a tutorial with them sensor. I work this project for my final college ( the license). I must controlled a chassis whit tracked 2 * DC Motor and with 6 * sensor Sharp 2D120X , 3 * sensor Sharp 2Y0A21 , 2*sensor QRE 1113 and 1 * senzor LV-MaxSonar-EZ0. Plus a communication with PC and robot . I can not debugging line to line , give this error. You can explain me ? There are two method to debug your code in Microchip MPLAB IDE, the first one is to use the MPLAB Simulation (without PICKit2, menu Debugger -> Select Tool -> MPLAB SIM) and the second one is to use the “In Circuit Debugger” (with PICKit2). Remember not all the Microchip PIC microcontroller have “In Circuit Debugger” feature (read the datasheet). In the Special Microcontroller Features of the data sheet pic16f886 is say “In-Circuit Debugger (on board)” . When i instal the first time the mplab ,and degguing your program from her , it’s work the debugging. and other cod it’s works but later become this error . With MPLAB SIM it’s work fine , but I need to see in real the input and output of my pin . For example , now i need to see the data when i trasnmit from serial port. 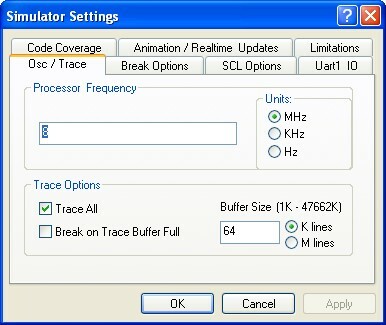 I transmit from a application create in Visual C# through a Easy-Radio Transmiter ER400TS. The Microchip PIC16F886 microcontroller doesn’t has the “In Circuit Debugger (ICD) via Two Pins” feature, it require special external board in order to debug the PIC16F886 microcontroller with this method. To understand the different please read the Microchip PIC18F24J11 (advanced 8-bit, 28-pin, 16KB flash) microcontroller datasheet. I upgraded to Microchip MPLAB IDE v8.66 with HI-TECH C Compiler v9.81 successfully! Copyright (C) 2010 Microchip Technology Inc.
Make sure you install the Microchip HI-TECH C Compiler correctly and check your MPLAB IDE C compiler setting. From the MPLAB IDE menu choose Project -> Select Language Toolsuite, and on the ToolSuite Contents choose HI-TECH ANSI C Compiler. I installed again HI-TECH ANSI C Compiler, but the same errors persist. In fact any of previous symbol are present neither in pic.h nor in pic16f690.h. Please check again your installation and Microchip MPLAB IDE configuration, make sure it use the Microchip HI-TECH C compiler Toolsuite to compile your program. In my previous comment I forgot to mention this is for 12F683 and I have not updated all comments. hey ! I tried this code and i’m not sure why you have the 12000000/FOSC and the delay of 164. Can you please explain it to me and also i am trying to generate 40khz. ive tried a few things and i cnt get it to more than 5 khz can you please explain how i could achieve that. In response to #3 #19 etc, i.e. you that get undefined symbols. The problem is that in Hi-tech compiler v9.81 they have changed include file handling and to the the example to work you have to define_LEGACY_HEADERS before the #include of pic.h. And now it is working fine. MCUs Version 9.81 Release Notes) for more details.